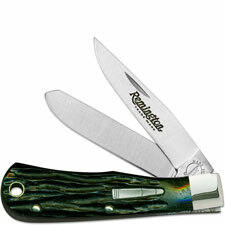 Remington Bullet Knives have been one of the better knives to put up and collect. Every since their reintroduction in 1982 they have almost always went up in value. (Except for a spurt of overproduction from about 1990-1993, when Remington thought the collectorís market was a bottomless hole.) A 1982 Bullet knife originally retailed at about $39.99. Today if it is in mint condition with all papers and box it will bring somewhere around $650.00. Now that is better than a lot of Wall Street Investments.